--There have been 53 Super Bowls. While I have seen many of them, I can't remember one that was more hum-drum than what we saw in Atlanta Sunday night. Talk of the Patriots and Rams lighting up the scoreboard at Mercedes-Benz Field went up in smoke. I didn't think the two teams would run up and down the field when you have defensive co-ordinators like Bill Belichick and Wade Phillips, but I didn't think we would get a 13-3 game either. While some Super Bowls have been full of excitement, this one was blah. It had as much spice to it as a rice cake. It was as bland as could be. I can't even think as to what the signature play of the game would be, because really there were none. Was it the Rob Gronkowski catch that led to the Sony Michel TD---the only one of the game? Was it the Stephon Gilmore INT of Jared Goff in the 2nd quarter inside the Patriots 5? Was it something else? We can't talk about Tom Brady's brilliance in this game because it wasn't there. The potent Rams offence was shut down by a defence that people said wasn't of championship calibre. Its the Patriots! As I said Friday, you had to play a perfect game to beat them and maybe add some trickery and we didn't see that from a Rams team that looked intimidated. Jared Goff was horrible on the game's biggest stage. 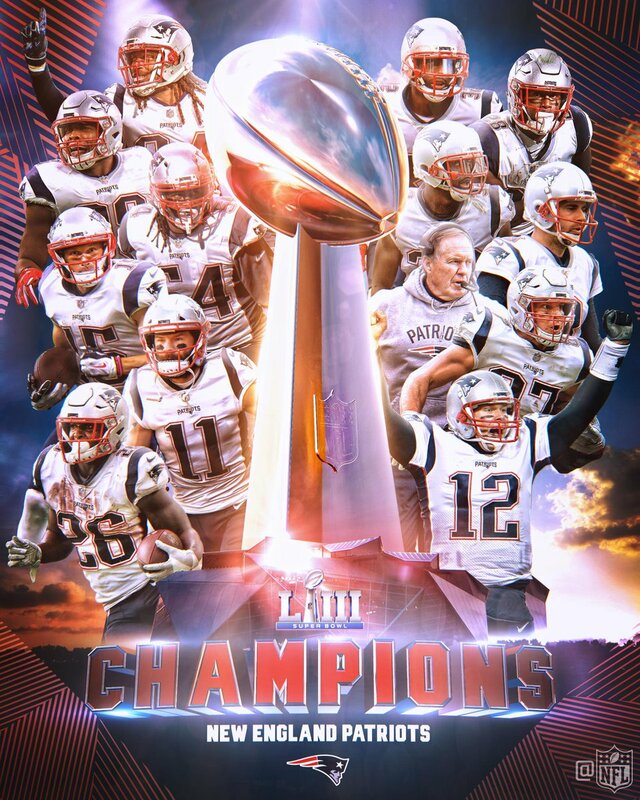 As a result, the Patriots win again much to the disgust of all the New England haters out there as well as the New Orleans Saints fans who I'm sure are saying they would have beaten New England had it not been for that non-call in the NFC Championship game. --I simply don't understand why Canada West uses the playoff system it does. It is obvious that the final wins-losses record is not the determining factor, yet it should be. Yes, schools don't play one another in a season, but when everything shook down at the end of the regular season, the Cougars had a 17-3 record which included sweeps of Calgary at the start of the year and Saskatchewan at the end of the year. It left both Calgaty and Regina at 17-3 with Saskatchewan at 16-4. One would think Regina would get the tiebreaker between themselves and the Dinos because of their two wins. HA HA HA HA HA!! Under the ridiculous RPI system Canada West uses, the Cougars are seeded behind both Calgary and the U of S and they would have been fourth had it not been for UBC beating Alberta in overtime Saturday. Congrats, you finished first in the regular season and you don't get rewarded for it with homecourt advantage. That is dumb, its beyond dumb. Then you look at the men's side where the Cougars after a weekend split with the Huskies finished 14-6 with the U of S finishing at 11-9. The Huskies though through the help of RPI finish 4th ahead of Regina, Fraser Valley, Winnipeg, and Lethbridge. How? Talk about a flawed process. To me, it would seem as if wins don't really mean as much as they should. Yes, the schedules are unbalanced, but can the top four teams not be seeded 1-4 because of wins-losses. If wins-losses don't matter, why are we keeping standings instead of RPI. This needs to be fixed somehow. Then again, this is a conference with a national body that has no clue about to regulate things (ie: eligibility issues) so why should I expect anything to change. All this does is hurt the credibility of University Sports and the many fine athletes who take part in my mind. What this sadly takes away from were four great basketball games this weekend. The U of R had a huge comeback in the women's game to win Friday night while the men's team let a big lead get away as they lost. Both came back to win in a pair of games which saw the intensity you would expect when the two provincial rivals go at it. It was a great display of the game, but that display is watered down because of something that is not under the control of the teams involved. --Was Saturday's WWE card in Regina a giant rip-off or a night well spent at the Brandt Centre? I guess it depends on who you talk to. While at the Cougars game Saturday, I got texts from a few people at the Brandt Centre who were not happy with the fact that some of the top talent that had been advertised were no shows. Others then told me the show was great with some good matches. You tell me. Was it good or not? Consider this blogger unimpressed that the merchandise table did not offer Brock Lesnar Suplex City Regina, SK shirts. Yes, I had people on the lookout for them. Those would have been awesome! I am guessing they would have even sold them in 3XL because god knows there are others who wouldn't when events roll through for whatever reason. --What happened to the Colorado Avalanche? --There are many fast skaters in the NHL, but I don't see defenceman turn around and stop skating backwards when Connor McDavid picks up the puck in his own end and starts steaming up the ice. --Why do I think the William Nylander contract will cost the Leafs either Auston Matthews or Mitch Marner. From what I am hearing they can't keep both RFA's and an offer sheet will be presented by someone. --It is beginning to sound as if Bo Levi Mitchell doesn't want to hold a clipboard so he will be coming back to Calgary. Is Bo Levi afraid to compete for a number two job knowing he might get beat and come back to the CFL with his tail between his legs? He can come up here and be the league's best or second-best quarterback, but why not take a shot at working your way up the depth chart. Its not like he doesn't have the tools to do it. The Stampeders obviously want him to come back home and I am guessing the CFL does too seeing the talent level at that position league-wide is eroding. --Jacques Chapdelaine has become the OC in Toronto and already some believe his style with James Franklin will not mesh. If the Argos are looking to move Franklin, I know a team who might be interested. Franklin knows the Steve McAdoo system. It's worth a call. --The Alouettes have a new helmet and a new look. What is that exactly on their helmet? Is that their new logo? Do they have a new logo? I'm confused! Johnny Manziel wasn't at the unveiling ceremony as the team said he had the flu. Is it just me or does Johnny get "the flu" quite a bit? --That's all I got. Have a great week! Can't really argue against Brady being the best of all time anymore. 9 super bowl appearances with 6 wins. Love em or hate em, they are a historic dynasty. Game was bad, but I would still take it over this year's Grey Cup which was bad as well. So a team that finished atop the standings because they went 4-0 against the two schools that finished 2nd and 3rd, get seeded 3rd? That makes absolutely no sense at all. No wonder University sports struggles to get respect. That final 2:49 took 31 minutes to play. Give me CFL anytime. Another let down for the "real" football fans. As usual the hype far exceeded the actual game. I'm sure the wannabes will have the usual insults for the CFL. NFL product is over rated from an entertainment point of view. Bring on the insults wannabes. LOL at all the rubes thinking the CFL is a better product. They likely think the AHL is superior to the NHL too. Wouldn't say WWE in Regina was a bust, but the star-power was certainly lacking with no Rollins or Banks. Stroman is a beast though. Way bigger in person than he looks on TV. SWC would rather go to MacDonalds for a quarter-pounder than the Keg for a steak too. This what league is better crap is such a childs fight. Good for you SWC, you would rather watch the CFL. Others think that way and others believe the NFL is a superior product (like me). At the end of the day football is football. I will watch CIS, CFL, NCAA, NFL and I will watch the AAF next weekend as well. To those who are on their soapbox preaching one league over the other, just stop.